Retired investors face a tough balancing act – they must preserve their capital while ensuring they can draw a sustainable income by carefully managing their risk. To meet these objectives require earning a certain level of returns, but what if weak markets undermine the required returns? The outperformance of the Denker SCI Stable Fund, despite weak markets and poor returns across asset classes, show that it is possible to beat the odds. It all boils down to a disciplined, tried-and-tested investment process that focuses on what is within our control, so that we can make the most of those factors. Generating consistent returns for investors requiring an income is a challenge. Investors drawing a regular income from their investment cannot afford to take on excessive risk. 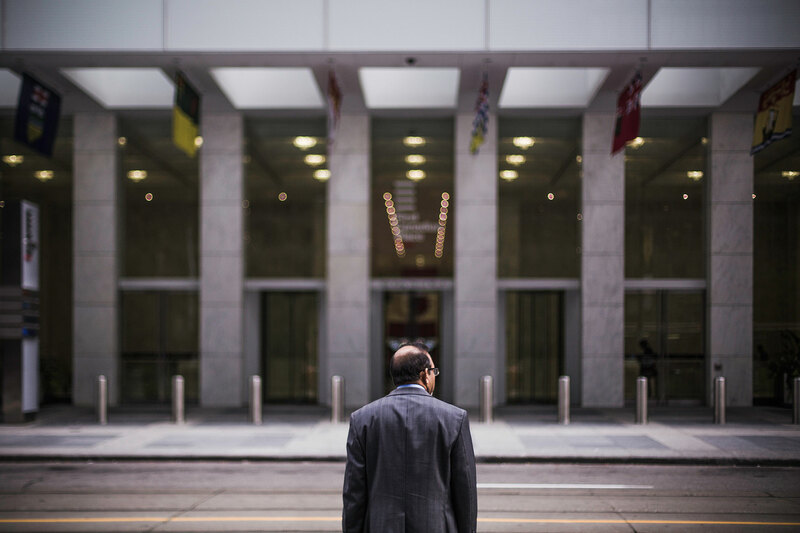 When investors require a predictable income from their portfolios, for example retired investors, it means they must sell assets even when the market is down. These investors, who cannot add substantially to capital anymore, face a tough balancing act. They must have sufficient capital in the market to participate in any surprisingly good returns, while ensuring sufficient risk management so as to prevent a loss of capital that could endanger the ability to draw income sustainably. By reducing the riskiness of their investment portfolio, they can raise the number of years that their portfolio can deliver sustainable income. The Denker SCI Stable Fund is for retired investors and aims to achieve a return of CPI+4%. In May 2017, we launched the Denker SCI Stable Fund, as a unique and attractive investment solution for retired investors. We believe that investors’ ability to preserve their capital while drawing an income is greatly enhanced if the fund can deliver a given level of return – in this case CPI+4% – at lower risk. However, the ability to do so depends very much on what returns are being generated by the market. We have outperformed our peers despite weak markets and poor returns from asset classes. The two years that followed the launch of our stable fund up until now proved to be particularly tough for markets. Nevertheless, despite poor market performance, the fund has managed to deliver favourable returns relative to the market and peers, as shown in the figures below. Figure 1 summarises the annualised volatility (a measure of riskiness) and returns generated by the more prominent investable asset classes, as well as the five largest funds in the multi-asset low equity category, which is most suitable for post-retirement investors. From left to right assets show rising volatility (or increasing riskiness). Along the vertical axis we show realised returns. Annualised risk and returns are for the period 1 June 2017 to 28 February 2019. What can we observe from the above figures? Market returns have been poor across the spectrum. 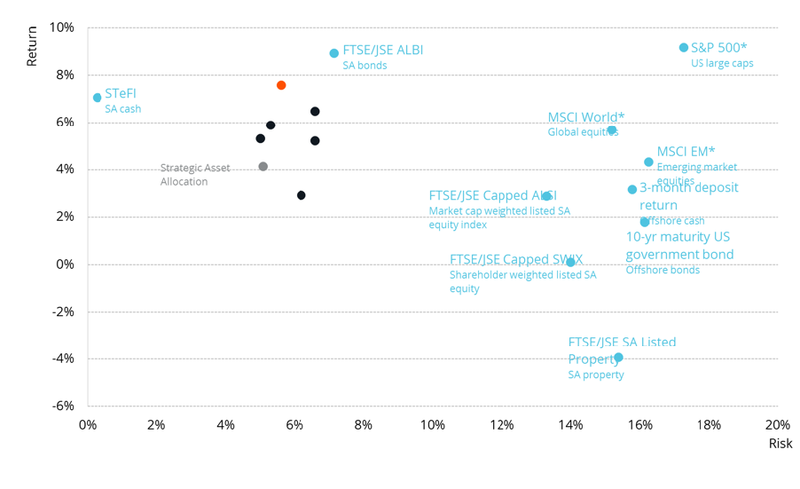 In this market of low returns we are pleased that the Denker SCI Stable Fund earned relatively attractive returns (given what was available) at similar levels of risks as its large peers in the ASISA category. Higher-risk assets don’t necessarily generate higher returns. It only means that these assets offer the potential for higher returns. South African bonds and cash have performed better than all asset classes for the rand investor, with the S&P 500 being the sole exception. Only the S&P 500 (in rands) have exceeded returns from the South African bond market. All other risky assets have delivered lower returns to investors than the South African cash market. Low-risk assets are not necessarily the answer. We caution against investing solely in what seems like low-risk, high-return assets – domestic cash and bonds. Investors’ long-term interest would be poorly served if, after a period of poor returns, they reduce exposure to assets that have the potential – and are expected – to add to their stock of capital. A passive investment would not have created a better outcome. The grey dot on Figure 1 shows the return that would have been earned had the investor held the strategic asset allocation through a passive investment. 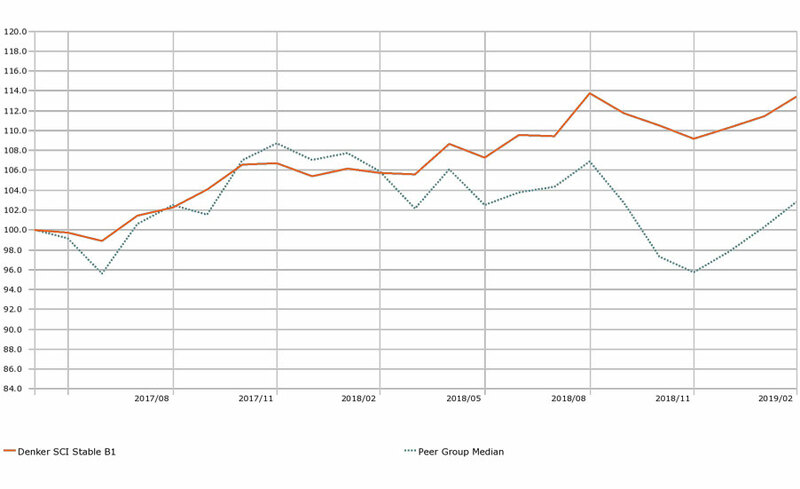 So why, despite poor market returns have we been able to outperform our peers? The difference in return cannot be attributed to alpha generated by the equity allocations. We remind investors that both domestic and offshore equity assets are indexed. The fund does not aim to generate alpha (excess returns when compared with the index) from these holdings. Instead, the fund aims to generate returns equal to those delivered by the indices but at the lowest possible cost to the investor. The reason why we are able to achieve this is deceptively simple – following a disciplined, tried-and-tested investment process for every investment decision we make. A successful investment process is about making the most of what is within your control. We have written several times before about the importance of understanding and buying into an investment manager’s investment process for investors. A critical aspect of understanding an investment philosophy and process is understanding what is within our control and what is beyond our control. For example, while we can control whether we respond to an attractive opportunity because of our agility as a smaller investment manager, we cannot control political events and the impact of these on investor sentiment. But we do have the skills, processes and experience to make investments that contribute to our investors’ outcomes across market cycles and economic downturns. We can control which companies we select to include in our portfolio, following a stringent and well-tested set of criteria. The Denker SCI Stable Fund is managed according to a strategic asset allocation benchmark. As returns cannot be known in advance the fund is constructed to offer the best chance of realising the targeted return. This benchmark allocation is informed by the riskiness of the different assets and the range of potential returns that can be expected under different scenarios. Simply put, it is the asset allocation that is most likely to result in the fund delivering its targeted return (given regulatory constraints) of CPI+4%. The higher return can be largely attributed to our property investments. The property investments are benchmark agnostic and aim to earn a risk-adjusted return of 12-15% per year. Since the inception of the fund (2 May 2017), the property benchmark index lost 11.6% of its value, while the property investments held in the fund gained 17.7%over the same time. This disparity in performance contributed ~3.5% of performance to investors in the fund. It is unlikely that the fund will be able to achieve this level of outperformance over the strategic asset allocation benchmark in future. The conditions that gave rise to the large declines in the benchmark index are unlikely to be repeated. We do, however, remain cautious about the prospects for the domestic property market going forward. We believe that much of the negative sentiment is already priced in, so small incremental changes to sentiment will result in a significant change in returns based on relative valuations alone. We are well-positioned to capitalise on these opportunities when they arise because we are agile. We see agility as the ability to identify opportunities and act on them promptly to build up a decent position, so to this end, our scale, agility and alignment with investors as an owner-managed firm provides us with a differentiated focus. This, combined with our long-term and disciplined approach, which has been proven to deliver peer-beating returns should be reassuring to investors, who can only also manage what is within their control: their ability to stay the course and avoid crystallising losses when markets are temporarily weak. The information in this communication or document belongs to Denker Capital (Pty) Ltd (Denker Capital). This information should only be evaluated for its intended purpose and may not be reproduced, distributed or published without our written consent. While we have undertaken to provide information that is true and not misleading in any way, all information provided by Denker Capital is not guaranteed and is for illustrative purposes only. The information does not take the circumstances of a particular person or entity into account and is not advice in relation to an investment or transaction. Because there are risks involved in buying or selling financial products, please do not rely on any information without appropriate advice from an independent financial adviser. We will not be held responsible for any loss or damages suffered by any person or entity as a result of them relying on, or not acting on, any of the information provided. Please note that past performances are not necessarily an accurate determination of future performances. SCI stands for Sanlam Collective Investments (RF) (Pty), a registered and approved Manager in Collective Investment Schemes in Securities. Madalet joined the team in 2016 to head up the multi-asset class division. She started her investment career at Investec Securities as a research assistant to top-rated investment strategist Brian Kantor. In 2008 she joined Element Investment Managers as an analyst responsible for fixed income, money market and property investments. Madalet joined Nedgroup Investments in 2010 and was responsible for managing the Nedgroup Private Wealth Bond and Property Funds.